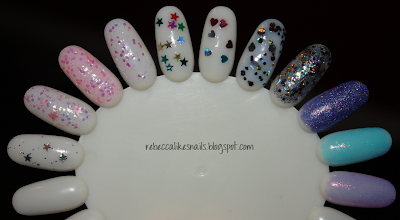 rebecca likes nails: Kleancolor Glitter Swatch Spam! I am so excited about these glitters, it's unreal. I've taken close-up bottle shots, swatches alone on a wheel, and swatches on the nail over other polishes. All pictures can be enlarged by clicking on the picture. 2 sizes of holographic glitter and star-shaped glitter in a clear base. Iridescent multi-sized glitter and stars in a light pink base. Iridescent multi-sized glitter in a bright pink base. Iridescent multi-sized glitter in a light purple base. As you may notice, three of those are very similar. On the website, they don't look quite as similar as they do in person. You do not need both Mix Signal and Take A Hint, they are virtually identical apart from one having a more pigmented base. Aurora is also very similar but with the addition of iridescent stars. It is a bit difficult to get the stars out of the bottle, and trying to place them on your nail sort of leaves you with a big blob of clear polish. It is easier to blob them onto paper and then pick them up with a dotting tool or toothpick. I totally recommend this polish for looks like this, or if you want to add some stars into nail art. These three girly glitters are so adorable layered.The stars in this one are iridescent and give a more subtle look. Because they are iridescent they are also thinner and will probably be easier to cover with topcoat. Now, this is a strange combo, and it was hard to capture. But over this darker color, the glitter in Aurora really showed a green flash. I was not expecting that! How cute is this? I think a combo like this can be as pleasing as some intense nail art or a holographic polish. These two polishes just work well together. This was another one of those "I-don't-want-to-take-it-off-but-I-have-to-keep-swatching" moments. Again, really pretty, but you don't need this polish and Mix Signal. Multi-colored stars in a clear base. Red, pink, silver, holographic and blue stars in a clear base. Multi-sized hex glitter, including giant glitter, in a slightly blackened base. The stars in this one aren't as hard to get out as they are in Silver Star because there are way more of them in the bottle! This one also includes silver, so you probably don't need Silver Star if you get Blind Date. Again, there are so many hearts in the bottle that fishing them out is pretty easy. This make very cute additions to cupcake manis as Dori from Kiss My Acetone shows you here! Afternoon Picnic over Sally Hansen Xtreme Wear Blue Me Away! One coat of this polish is not enough. And the base is a bit blackened, but it does not alter the color of the polish below it very much, if at all. If you are into party glitters like Lippmann Happy Birthday or Milani Gems, get this. It's on a whole other level. But I'm not sold on that combo either. Once I find the right "underwear" I'm sure this polish would be great! Okay! That was a lot of pictures! Oh, and you can get 5% off your order with the coupon code LETSTALK. They do go on rather thick, so I think you will need a fast-drying topcoat like Seche Vite if you plan on getting some of these. Some people say they smell much worse than other polishes but I didn't really find a huge difference. If your nose is sensitive, you might want to stay away. What do you guys think? Have you ordered any of these yet? Have any favorites that I should check out in my next order? I NEED Take a Hint. ASAP. i am very interested kleancolor so thank you so much for showing these too me! i appreciate your suggestions on which ones to get. i see many many online orders in my future! I need some of these! City Never Sleeps and Mixed Signal are GORGEOUS! I really like Afternoon Picnic, it looks awesome over that blue creme! So many glitters, love them! oh those stars and hearts are so pretty! I was just looking at the polishes on that site last night! I hope one of the chunky holos you got was chunky holo black. I love all of their glittery polishes and I'm definitely going to buy a few in the future. I bought a bootleg twinkly love a few weeks ago and when I use it I sometimes get one or even zero hearts on my brush when using it. does that happen to the real one too? @SAIDAridiculous - i didn't get chunky holo black actually! i got teal and purple. and yes, sometimes you have to put the brush in and out a bunch of times to get a heart on the brush, but it isn't too hard. E quero... muito lindos, nossa morri de vontade! you need to get Holo-Chrome i think you would love it.! kleancolor was actually the first brand i started collecting when i got into nails. their everywhere where i live. and their only 1 dollar. i have about 60. however i do have a sensitive nose which keeps me away. hahaha . great post.! @McDiaz714 - I have Holo Chrome! :) I'm wearing it now and I'm saving it for a separate post, because it's so awesome! I've been dying to order a crapload of Kleancolors! I don't know why they aren't that popular, I LOVE glitter! I ordered some Kleancolors from BeautyJoint on Jul 15th but I still haven't received it :( I'm a Canadian blogger as well, wondering how long it took for yours to arrive? OMG what are the two colors from the right on your color wheel?? I maximized the first photo and my jaw dropped. such a pretty blue and purple!! @pockified - they are Chunky Holo Teal and Chunky Holo Purple. The wheel swatches aren't very accurate though - I plan on posting more about them in the next few days.